At the final record shop stop on my recent vacation, I was flipping through the jazz "new arrivals" when I came across a copy of the world-famous Time Out for the asking price of $1. That's not a typo, it was indeed marked at one whole dollar. And this was no trashed copy, the cover was a strong VG+, while the vinyl fell somewhere between VG and VG+. My interest was peaked. I didn't have a copy of this classic album in my collection because for many years it was so readily available at such an affordable price (I remember when you could find copies in the bargain bins), that I always just figured I would grab it at some point. Well, as we all know, vintage vinyl prices have steadily risen over the past twenty years, and before I knew it, even a flimsy 1970's pressing was sometimes fetching $20 - and that wasn't always for a VG+ copy. Figuring this $1 copy must be at the very least a later pressing, I pulled the vinyl out of the sleeve with no expectations, but - alas! - to my very pleasant surprise it was a 6-eye pressing, albeit the one with the "CBS" just beneath "Columbia" at the top of the label. Without listening to it I made the purchase, I mean what really could I have to lose? I was already hauling back a bag of full of records on the airplane. As it turns out this was a 6-eye pressing from 1961, with the cropped cover and the "Featuring Take Five & Blue Rondo A La Turk" text in the top right corner. I wasn't sure what to expect sound-wise, but the 6-eye pressing indicated that it should be of a pretty high audio quality. Once on the turntable back home I was very happy with the loud and clear audio coming through the speakers, with a nice separation and clarity of the interplay between the quartet. London Jazz Collector claims his "Columbia-CBS" 6-eye copy of Time Out is "inferior sonically to the original editions," but I can only think he may be right that his pressing may be "an end-of-run stamper artefact." I don't have an original to compare with, but I have a hard time imagining that my copy could be called sonically inferior. Of course, we all know that the same pressings can differ in quality, so it is not wholly out of the ordinary that there would be some anomalies, either on his copy or mine. It doesn't just sound sophisticated - it really is sophisticated music, which lends itself to cerebral appreciation, yet never stops swingin'. Countless other musicians built on its pioneering experiments, yet it's amazingly accessible for all its advanced thinking, a rare feat in any art form. This belongs in even the most rudimentary jazz collection. It's obvious that I disagree with [Steve] Race's observation [in the liner notes] that "something great has been attempted...and achieved" in Time Out. If Brubeck wants to experiment with time, let him not insult his audience with such crashing-bore devices as mentioned. Better still, if he wants to experiment, let him begin with trying some real jazz. Ouch. But in a two short years "Take Five" would become a Top 40 hit single and go on to become the best selling jazz single of all-time. 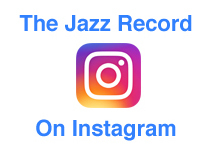 I guess in the end the jazz audience won out in this battle with the critics, they could recognize a masterpiece when they heard it, and now there is no doubt that Time Out is one of the greatest jazz records ever produced. As noted above, this is a 1961 6-eye "Columbia-CBS" pressing with the "CBS" text appearing at the top below the "Columbia" name. I have no idea why they all of a sudden decided to make this change to the label, as CBS had owned Columbia Records since the late 1930's and this extra marking disappears by 1962 with the appearance of the "two-eye" labels. The sound quality on my vinyl is great, with the players shining through with depth and clarity. Interesting aside: According to Wikipedia, CBS (Columbia Broadcasting System), which bought Columbia Records in the late 1930's, had actually been co-founded by Columbia Records in 1927. The vinyl has "XLP-47853-1CC" and "XLP-47854-1CB" stamped in the runout on the respective sides ("47853" on Side 1 and "47854" on Side 2). The "1" indicates that the original mono mix was still being used on this 1961 pressing, which is nice to know but doesn't really give any indication of the quality of my particular copy of the album. 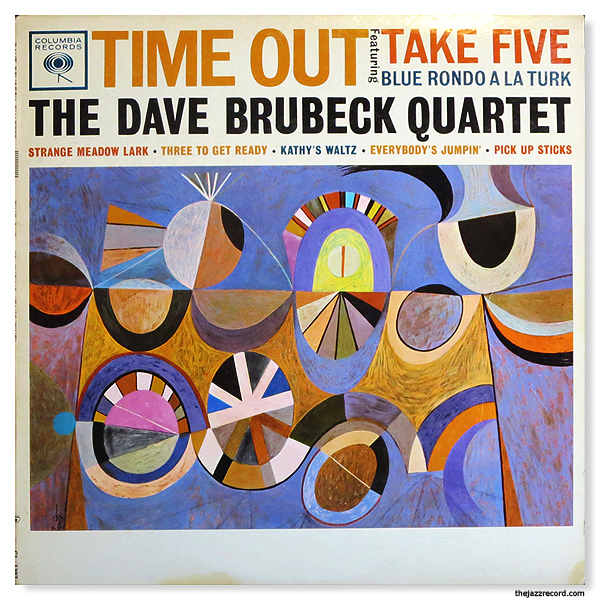 Time Out - Stereo Cover Folded oVer? While photographing the back cover I noticed that at the very top beneath the paste-on liner notes there is the "STEREO" symbol used for the top of the stereo covers. This would indicate that Columbia was printing only a single oversized front paste-on cover for both mono and stereo releases. This certainly explains the difference in the covers between the mono and stereo pressings, with the bottom white border shrinking on the latter while the illustration stays the same size. I always figured these two covers were singular cover slicks, but it appears that is not the case. I can't say if they also did this on the original Time Out covers (as opposed to this later cover with "Featuring"), although the evidence points to the answer being that they did, as the mono versions have a large black bar on the bottom that disappears with the stereo versions (this black bar change can be seen on Mingus Ah Um as well, and on Kind Of Blue there is less of Miles' tie at the bottom of the stereo version while his head remains the same size). This is all news to me, but perhaps it is well known in some circles. In any case, an interesting discovery that illustrates that what I always thought was a conscious design choice between mono and stereo covers during this period turns out to be a cost-saving measure.